"The Hampshire" is one of our most sought after chandeliers. The balanced curves instantly transport one back to the old days. 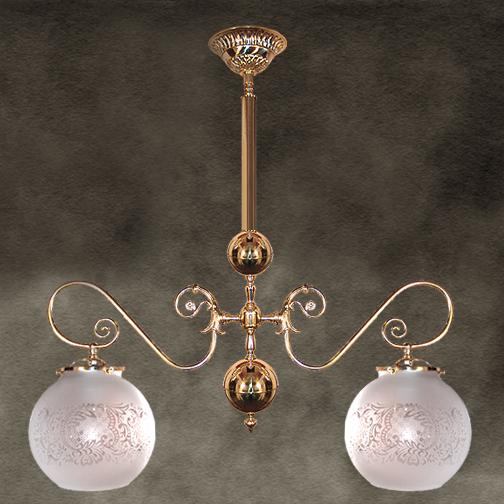 This CLC original, along with many matching wall lights and other chandeliers, was featured in the Warner Brothers' "Benjamin Buttons" film with Brad Pitt. Features hand crafted brass tube arms, cast brass arm backs and a gorgeous design. Can be designed with arms facing up or down. Free mounting hardware included. Shown in Polished Brass. Available in different Metal Finishes, different Glass, Back Plate, more or fewer arms, arm direction, tubing style and many other Custom Options.